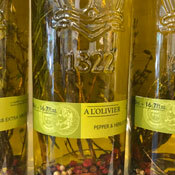 Founded in Paris in 1822, A L'Olivier is France's most respected producer of specialty oils and vinegars. Jérôme Blanvillain's interest in infusing fresh herbs into high-quality extra virgin olive oil led to the development of a vacuum-sealing process that has become one of A L'Olivier's modern signatures. Oils are infused during the peak season for that particular herb, harvested by nearby farmers within days of infusion. A L'Olivier's classic, sweet, buttery French olive oil, infused with chili peppers, thyme, rosemary, and a combination of red, green, and black peppercorns is beautifully packaged and ready for gifting! This savory flavor combination is ideal for anything from red meat to green vegetables. Drizzle over pastas or mashed potatoes for extraordinary seasoning. A perfect gift for the host or hostess, and a stunning addition to any kitchen! In 1978, Jean-Claude Blanvillain bought A L'Olivier. Twenty years ago, the senior Blanvillain retired and left the business in the capable hands of brothers Jérôme and Benoît, who work on different aspects of the business, still valuing taste and quality above all else. Together, the brothers have expanded exporting, and company operations reach across France.